This is an ulcer of the mucosa in, or adjacent to, an acidbearing area. 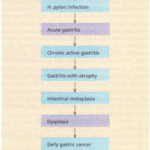 Most ulcers occur in the stomach or proximal duodenum but they can occur in the oesophagus (with oesophageal reflux), in the jejunum in the Zollinger- Ellison syndrome or after a gastroenterostomy, and finally in a Meckel’s diverticulum, which contains ectopic gastric mucosa. Duodenal ulceration is common; 15% of the population will suffer from a duodenal ulcer at some time. They are two to three times commoner than gastric ulcers. Duodenal ulcers are commoner in men than women (4:1) and both gastric and duodenal ulcers are more common in elderly people, i.e. an age-related incidence. There is considerable geographical variation. Duodenal ulcer is commoner in northern England and Scotland than in other parts of the UK. Much of the previous epidemiological data can be explained on the prevalence of H. pylori infection. • Mucosal defences: mucus, bicarbonate and prostaglandins. H. pylori plays a central role in both gastric and duodenal ulceration, although the mechanisms are unclear. Genetic susceptibiity may also playa role, particularly in patients who do not secrete blood group 0 antigen into gastric secretions. All of these affect acid secretion or the mucosal barrier. The only other important cause of gastric ulceration is SAIDs. Peptic ulceration is also seen in hyperparathyroidism (since calcium stimulates acid secretion) and in the Zollinger-Ellison syndrome. 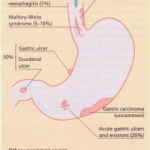 Gastric ulcer can occur in any part of the stomach, but is most commonly found on the lesser curve. Most duodenal ulcers are found in the duodenal cap with the surrounding mucosa appearing inflamed, haemorrhagic and friable (duodenitis). Histologically there is a break in the superficial epithelium penetrating down to the muscularis mucosa with a fibrous base and an increase in inflammatory cells. The ulcer may heal with fibrosis. Indigestion is a frequent symptom, but epigastric pain is the characteristic feature of ulcer disease. If the patient points directly to the epigastrium as the site of the pain, this has a high discriminatory value for diagnosis. The pain of a duodenal ulcer classically occurs at night as well as during the day. In both types of ulcer, pain is helped by antacids. The relationship of the pain to food is variable and on the whole is not helpful in diagnosis. However, patients with a duodenal ulcer may complain of pains when they are hungry. Nausea may accompany the pain, but vomiting is not frequent and when it occurs it may relieve the pain. Another symptom is heartburn, which is due to acid regurgitation. Anorexia and weight loss may occur, particularly with gastric ulcers. The symptoms of a duodenal ulcer are periodic with spontaneous relapses and remissions. Eighty per cent of patients will have a recurrence of symptoms within 1 year of the first episode. The natural history appears to be for the disease to remit over many years with the onset of gastritis with atrophy and decrease in acid secretion. 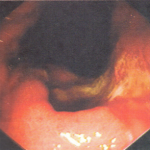 Fifty per cent of patients with a gastric ulcer will have a recurrence within 2 years. If the patient complains of persistent and severe pain, complications such as penetration into other organs should be considered. Back pain may suggest a penetrating posterior duodenal ulcer. Patients can present for the first time with either a haematemesis or melaena or with a perforation. Signs The only signs are those of epigastric tenderness but this is a poor discriminating sign. Tenderness does not necessarily imply disease and is frequently found in nonulcer dyspepsia. Many patients, particularly the young presenting with indigestion, can be treated symptomatically for 4-5 weeks without investigation. ENDOSCOPY is often the first investigation, with biopsy of all gastric ulcers, or BARIUM MEAL (double-contrast technique). A gastric ulcer is shown in Fig. 4.11 and a duodenal ulcer is ACID SECRETION STATUS. This is not useful to measure in most cases of peptic ulcer disease. The main use of this test is in the Zollinger-Ellison syndrome, but a serum gastrin is more useful. Secretions from the stomach are collected via a nasogastric tube before (basal secretion) and following stimulation by an injection of pentagastrin. This is a synthetic peptide containing the terminal five peptides of gastrin. BLOOD TESTS are unhelpful in uncomplicated cases. 1 Eradication of H. pylori. This therapy is now thought to ‘cure’ duodenal ulcers providing the organism is successfully eradicated. Eradication therapy is being given increasingly more frequently and may become the first-line therapy in all patients. 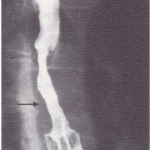 Barium meal showing a gastric ulcer (arrow). Barium meal showing a large chronic duodenal ulcer (arrow). 4 weeks’ treatment. It is being increasingly used for treatment of ulcers as it produces good symptom relief. (b) H2 receptor antagonists have been the first choice of therapy. They have molecular structures that fit the H2 receptors on the parietal cells. A single therapeutic dose in the evening produces, at least, an 80% reduction of nocturnal acid production until the following morning. Over 80% of duodenal ulcers will heal with a 2-month course of this group of drugs and symptoms are relieved quickly. There is little difference between the different H2 antagonists, but cimetidine is not usually given to young males because of the incidence of impotence which is low. 3 Other drugs. A number of other drugs have been shown to be effective, but are rarely used compared with the above. (a) Misoprostol. A synthetic analogue of prostaglandin E, inhibits gastric acid secretion and does promote gastric and duodenal ulcer healing. It is mainly used as a cytoprotective agent against NSAIDassociated gastric ulcers. Prophylaxis is 200 ILg, two to four times per day. Treatment is 800 ILg daily in divided doses, the main side-effect being diarrhoea. (b) Sucralfate possibly acts by protecting the mucosa from acid pepsin attack. It is a complex of aluminium hydroxide and sulphated sucrose, but it has minimal antacid properties. It is also used in the treatment of benign gastric ulceration and sometimes as a cytoprotective agent at a dose of 2 g daily in divided doses. 4 Miscellaneous. Stopping smoking should be strongly encouraged as smoking slows healing. Special diets, together with avoidance of coffee, alcohol or acid substances, are not required. The effectiveness of treatment should be assessed symptomatically. There is no need for follow-up endoscopy. If the patient fails to respond, the diagnosis should be reviewed. Duodenal ulcers are common and care must be taken not to falsely attribute abdominal symptoms to the finding of an ulcer. Treatment is given to ensure ulcer healing which must be checked with follow-up endoscopy and biopsies at 6 weeks. Failure to heal raises the question of malignancy and further treatment and follow-up endoscopy is required. There are a number of approaches to treatment. 1 H2-receptor antagonists have been the most common agents used for treatment, but omeprazole is being increasingly used as the initial therapy as symptom relief is rapid; follow-up with endoscopy and biopsies at 6 weeks. 2 Eradication of H. pylori. Eradication treatment should be given to all patients with a gastric ulcer; usually the presence of H. pylori has been documented at endoscopy. If the patient is taking an NSAID when the ulcer is discovered, eradication therapy should still be given if H. pylori is demonstrated. 3 Smoking should be strongly discouraged. Dietary changes are unnecessary. 4 Attempts should be made to stop NSAIDs in patients with peptic ulceration. This may be difficult in those with severe arthritis and if it is essential to continue NSAIDs either misoprostol or ranitidine should be prescribed concurrently. 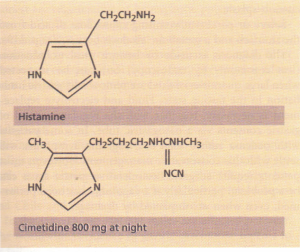 receptor antagonist showing the similarity to histamine. Other -irreceptor antagonists include ranitidine, famotidine and idine. 1 Partial gastrectomy. The principle in both types of gastrectomy performed for peptic ulcer disease is to remove the antral area that secretes gastrin, since this in turn stimulates acid production. (a) Billroth I partial gastrectomy. The lower part of the stomach is removed and the stomach remnant is connected to the duodenum. (b) Billroth II (Polya gastrectomy). The stomach remnant is connected to the first loop of jejunum (a gastroenterostomy) and the duodenum is closed. (b) Selective vagotomy (preserving coeliac branch of the gastroenterostomy/pyloroplasty. (c) Highly selective vagotomy or proximal gastric vagotomy, in which only the nerves supplying the parietal cells are transected, and therefore no drainage is required. With this type of operation there is little diarrhoea but the recurrence rate is still 5-10%. 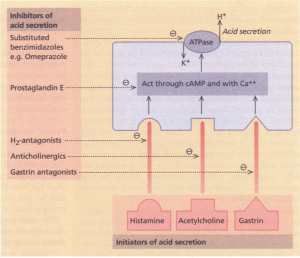 Diagrammatic representation of the mechanisms involved in acid secretion. LONG-TERM COMPLICATIONS OF SURGERY are still occasionally seen. A recurrent ulcer, which can appear in the stomach, duodenum or jejunum, often occurs at the stoma. The symptoms are similar to those seen in the unoperated stomach, with pain invariably being present, although patients may present with haemorrhage. 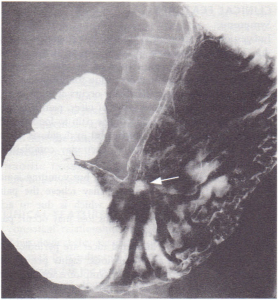 Because of the deformity of the stomach, investigation by endoscopy is preferred to X-ray examination. Treatment is now usually medical, using acid suppression and eradication of H. pylori. Consideration should be given to the possibility of the Zollinger-Ellison syndrome. Dumping. This is the term used to describe a number of upper abdominal symptoms, e.g. nausea and distension associated with sweating, faintness and palpitations, that occur in patients following gastrectomy or gastroenterostomy. 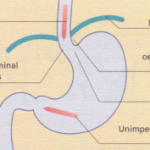 It is due to ‘dumping’ of food into the jejunum, which is followed by rapid fluid dilution of the high osmotic load. A number of patients have mild symptoms of dumping but learn to cope with them. It is rare for it to be a clinical problem and, if it is, the symptoms will have a functional element. Treatment should be with reassurance and symptomatic therapy. Further operations are rarely needed. This is chiefly seen after vagotomy. Urgency or recurrent severe episodes occur in 1% and can be a major problem. Treatment consists of antidiarrhoeals such as codeine phosphate but is not entirely satisfactory. Cholestyramine, a resin that binds bile salts, helps in some cases. Very occasionally the diarrhoea or steatorrhoea can be due to bacterial overgrowth in the blind loop of a Polya gastrectomy. Vomiting (afferent loop syndrome/bilious vomiting). The incidence of vomiting has decreased with the introduction of the more conservative operations. Vomiting occurs because food gets trapped owing to the altered anatomy. Treatment is symptomatic, except on the rare occasions when reconstructive surgery is required. Nutritional complications. Anaemia is most commonly due to iron deficiency caused by poor absorption. Treatment is with oral iron, which may be needed long-term. Megaloblastic anaemia is uncommon, but can be due to either folate deficiency (due to poor intake) or vitamin BI2 deficiency (due to long-term gastritis with atrophy resulting in intrinsic factor deficiency). 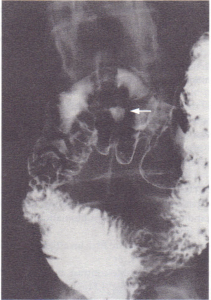 Osteomalacia is an uncommon late complication. Patients often fail to gain weight owing to anorexia after gastric surgery and a few suffer from severe protein-energy malnutrition as a result.